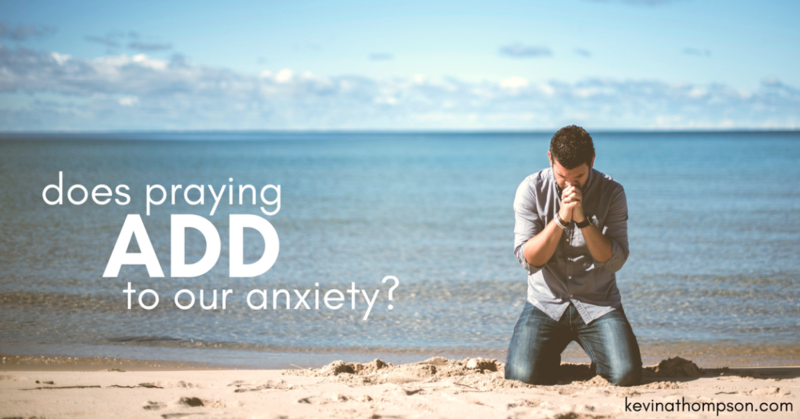 Does Praying Add to Our Anxiety? The Bible has a simple antidote to worry. We are to pray. That’s not to say that prayer will take away all earthly anxiety. It won’t. Some anxiety is beyond our control so we may have the need for medications and doctors. Other anxiety is part of life and gives us the opportunity to choose faith despite how we feel. However, prayer should have an overall positive impact on our lives. It should diminish our feelings of worry, concern, and general anxieties. But often it does not. In other situations, we do pray yet those prayers do not diminish our concerns. They actually heighten them. Why? How can prayer be bad for us? How can turning to God increase our worries rather than take them away? The problem is that we have made prayer solely a time in which we name our desires to God. We ask him to make our will His. It is perfectly acceptable to make our requests known to God and like a loving Father, He gladly hears from His children. However, the primary purpose of prayer is not for us to convince God to ordain our way. ; it is for us to submit to His. Our prayers often add to our anxieties because we are seeking things outside of His will and then wondering why God is not doing as we ask. Failing to recognize our need to submit our wills to His, we are left to wonder if either God doesn’t care for us or simply isn’t powerful enough to do anything in our lives. Either conclusion will increase our uncertainty in the midst of life’s difficulties. Our worries will increase rather than decrease. While the primary goal of prayer is never about us, it’s appropriate to assume that prayer will have a positive impact on our lives. God does not call us to pray simply for His sake. He doesn’t need our prayers. We are the one’s who desperately need to interact with God. In the midst of financial struggle, do you pray more for a financial miracle or for the ability to be faithful no matter your financial status? When facing suffering, do you pray more for the removal of the suffering or for that the suffering will make you know God more? In small group meetings, are prayer requests more about the preferred outcomes of medical tests or the transformation of our hearts? Are we praying more about our little kingdoms than we are God’s eternal Kingdom? Could it be that our increased anxieties are a sign of God’s grace? If our human-centric praying lessened our anxieties, we might never recognize that we are missing true communion with God. By allowing us to experience increased tension even when we pray, God is graciously calling us to a different way. Praying for what we want is okay, but our prayers must move pass our temporal desires and into those things which God has already promised to give us. We must claim our trust in Him more than simply proclaiming what we desire from Him. Our anxieties won’t be calmed by getting what we want; they will diminish as we exchange our kingdom for His. 3 Responses to Does Praying Add to Our Anxiety?